Our planets circles just one star, but Kevin Wagner and his team have found a planet that orbits a whacking three stars! How have they found this planet? They just looked. Most of the time, exoplanets, planets that are outside of our solar system, are discovered with the transit method. This method uses the brightness of a star to determine if a planet moves in front of it, because if that happens, the star gets a little bit dimmer, and with that, scientists can find out the size, orbit time and other things about that exoplanet. 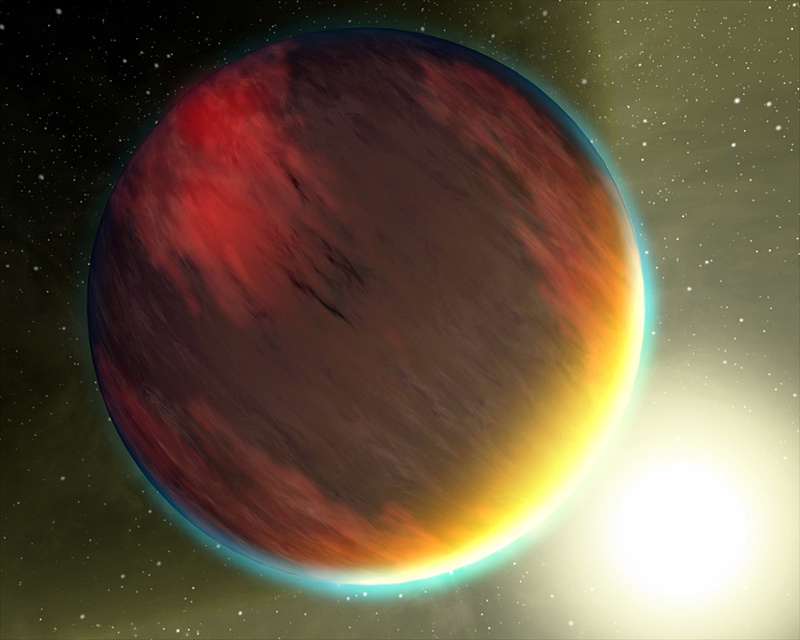 Discovering an exoplanet through directly looking at it with a telescope is really hard. Because the light from the star is so much brighter than the light that comes from the planet, it’s hard to see the thing, particularly because it’s also very close to the star. 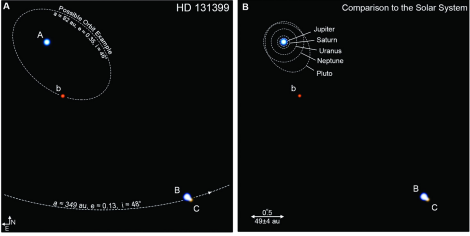 So scientists use some smart tricks to block out the starlight, and they can observe the planet. With this particular exoplanet, it was even harder than normal to block out the starlight, since there wasn’t just one star, but three. But there’s also a large advantage of directly observing an exoplanet compared to using the transit method; when they directly look at it, scientists can find out what kind of atmosphere the planet has. And Kevin Wagner and his team have found out that this new exoplanet is a bit like Jupiter. Planets like Jupiter aren’t very rare, in fact, it’s one of the most common types of exoplanets. And planets in star systems with more than one star aren’t that rare, but what makes this particular star system special is its size. This star system, which is called HD 131399, is way bigger than ours, which is quite weird, since planets usually don’t orbit that far away from the centre of a system with more than one star. This is because the gravity of ‘outer’ stars (B and C) make it impossible for a planet to form so close to those outer stars. Kevin Wagner and his team have two theories about how the planet ended up in its orbit. One theory is that the planet used to orbit the centre star or the outer stars and was kicked out of orbit by another planet. Another states that the planet already existed before the three-star system formed and the planet accidentally ended up in its odd orbit when the three-star system came into existence. The problem with the first theory is that it requires another large planet to hang around in the star system, the planet that kicked our Jupiter-like planet out of orbit, and scientists haven’t found this planet yet. It could, however, be the case that we simply can’t detect this planet. But for now, this strange star-system remains a mystery.